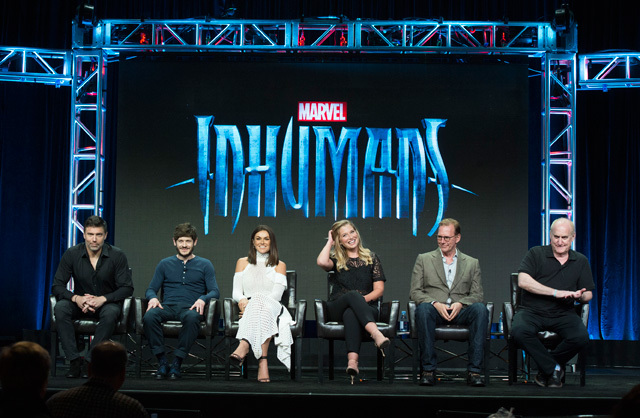 The cast and executive producers of Marvel’s Inhumans participated in a Q&A session at the Disney/ABC Television Group 2017 Summer Press Tour on Sunday, August 6 at The Beverly Hilton in Beverly Hills, California. The panelists included cast members Anson Mount, Iwan Rheon, Serinda Swan and Ellen Woglom, along with executive producers Scott Buck and Jeph Loeb. Following the panel, ABC released Marvel’s Inhumans portraits which you can view in the gallery below, along with photos from the Q&A and more.